Most advertisers are very good at telling their customers what a product is, how it is made, what cool features it has, how good a quality it is etc…. Then they wonder how come no one is buying their product! The hard truth is, customers are just not interested in your great new product. They are concerned with their own problems and interests. However, if your product can solve their problem or appeal to their interest, then their interest rises dramatically. But that doesn’t mean that they can always translate your product features into any benefit to them. So, don’t just tell them what it is – show them what it can do for them. How will they be better off as a result of your product or service? Then they might just take more interest and even buy it. EU VAT CHANGE, THREAT TO SMALL DIGITAL BUSINESSES? 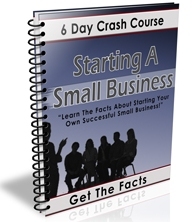 Learn The Basics About Starting Your Very Own Successful Small Business!